The Explorer 4000 backpack is very rugged and versatile. After trying out many backpacks for a survival Bug Out Bag, this is the one my 5'-4" wife liked the best, and it also adjusted to fit me nicely and I am 5'-11" tall. I preferred the TETON Sports Outfitter 4600 simply because of its extra capacity, but it was too big for my wife. Every prepper should have at least one Bug Out Bag for a long term Doomsday survival scenario, but that can also be used for hiking and camping. The TETON Sports Explorer 4000 Internal Frame Backpack fits the bill. The Sports Explorer 4000 is very similar to the Sports Outfitter 4600 backpack except with a different design, features and color, and it is slightly smaller (4000 cubic inches versus 4600 cubic inches). This particular one is very versatile, very adjustable to fit between an average sized woman to large sized man, has a good amount of storage capacity and attachment points, and is comfortable and ultra light for its size. There is an integrated rain fly in the bottom of the pack. This pack accepts a hydration system and the 3.0 liter Platypus Big Zip Reservoir fits it nicely. If you connect a Sawyer 3-Way Inline Water Filter to the Platypus Big Zip, you can fill the hydration pack directly from a river, lake or stream along the trail, and filter-drink the water while hiking. The Sawyer 3-Way inline Water Filter is guaranteed to filter 1 million gallons. Check out the YouTube videos below to learn more about this great backpack and the Sawyer 3-Way Inline Water Filter and 3.0 liter Platypus Big Zip hydration system. Every hiker and prepper should try on several backpacks to find the best one for them. Comfort is one of the most important feature. I am a 5'-11" tall man and this backpack fits me comfortably. My wife finally settled on keeping this backpack after trying on many backpacks from different stores and even more from Amazon that we sent back. After packing your Bug-Out Bag, take it with you (along with hiking shoes) on medium to long car trips away from your home. Better to have it and not need it, than to need it and not have it. Also, it is recommended that you practice and train using your Bug Out Bag until you can get it fully loaded and walk for miles and over terrain to get yourself in shape, and to make sure your hiking shoes are broken in. "The backpack is perfect. Its strong and sturdy......has plenty of space and the pockets are big...."
"I bought this backpack specifically for a four-day hike in the Grand Canyon. It met or exceeded all of my expectations. Very comfortable and I had no problems with zippers, latches, straps, etc." "This is a great backpack. I am really surprised how cheap this bag is considering the options that it offers, plus it is really well made. I took it with me on a 3 day 2 night trip backpacking, and it held all my gear with everything easily accessible. I will be a loyal Teton customer from now on." "Amazing quality. I am backpacking South America With it for 4 months and so far it's exactly what I expected and need." "Works very well for me with 30+ pounds load in the bag. No shoulder or back pain even after hiking 20 miles in 2 days." 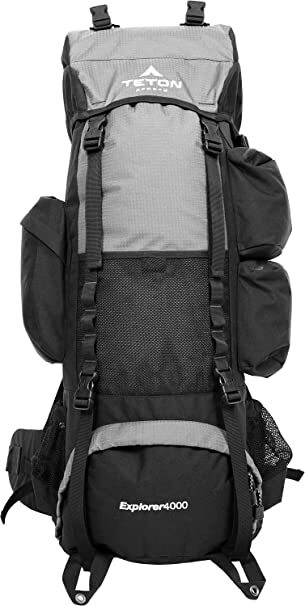 "Great backpack for anyone going on a week or less backpacking trip. I guess longer could work too, if you are crafty anyways. I can't imagine a better pack at this pricepoint. My friend used it for a five day trip and had no discomfort, other then that provided by the steep trails and rain! If you are thinking about it, BUY THIS PACK! $80 IS A STEAL!" "Impressed with this pack. Incredible room. Took all I had in a Large Alice Pack with room for more. Fits well, weight rides great. It actually feels like it's lighter from picking it up to putting it on, it distributes the weight THAT well. The included rainfly is a nice extra and a great idea. For a few nights on the trail, this is a good pack for the price." "I was unsure about this bag as I thought it would be too big and not a quality piece being it was priced so low. I love it! Use it for hiking and reg truck camping trips. Holds everything I need and then some if needed and is stout. I will buy Teton products again in the future." The following YouTube video by Teton Sports thoroughly explains every feature of the TETON Sports Explorer 4000 Backpack.